Located along the southeast coast of England, Dorset has had a fairly tumultuous history that saw its involvement in numerous wars, skirmishes and invasions, including the Glorious Revolution (1688), the English Civil War (1642–1651) and the Monmouth Rebellion (1685). Bubonic plague also first arrived to England in 1348 on a ship that arrived into Melcombe Regis in what is now Weymouth. 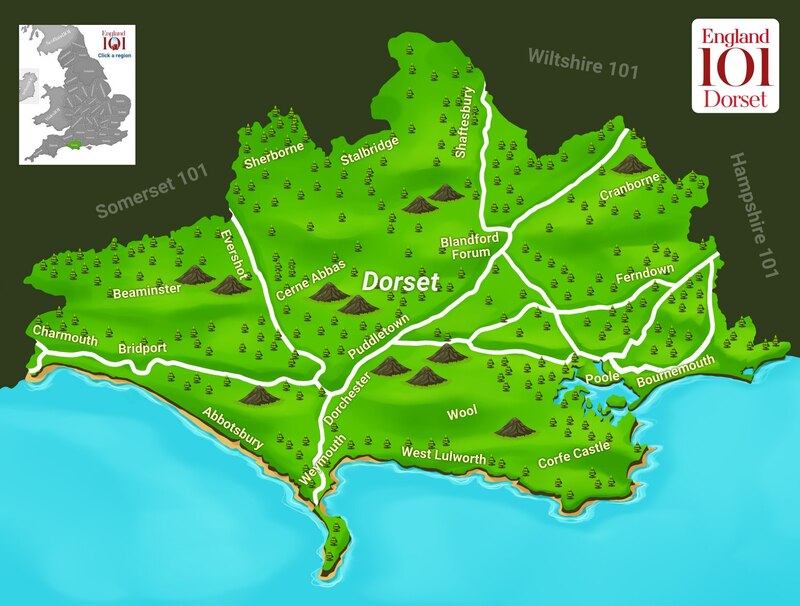 Despite all of this, Dorset is today a beautiful, peaceful county that is popular with tourists for its plethora of largely rural, green countryside and fantastic seacoasts, which include the UNESCO World Heritage Site, the Jurassic Coast. This section of the Jurassic Coast is particularly noted for its collection of interesting natural geological formations, such as Durdle Door, a natural sea arch that juts out into the English Channel near Lulworth. Indeed, it is Dorset’s coastline that basically keeps the county going, through both tourism and the major ports in the county at Poole, Weymouth and Portland, which bolster the local economy through large amounts of international trade. Poole Harbour is the second largest natural harbour in the world, second only to that of Sydney, Australia, and the Weymouth and Portland National Sailing Academy is set to host the sailing events during the 2012 London Summer Olympic Games. Just off the coast in Poole Harbour, Brownsea Island is a largely wooded island owned by the natural trust. In addition to being one of the few places in England where red squirrels still roam freely, Brownsea Island was also the birthplace of the Scouting movement, thanks to its relatively untouched natural environment. 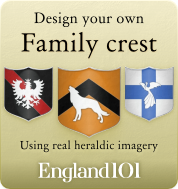 Dorset’s coast has also led to a strong military presence here through the ages. Dorset ships have been involved in numerous international battles, including a decisive battle against the Spanish Armada, and Allied troops were deployed from Dorset for the D-Day battle during World War II. This military history is now commemorated in several museums in Dorset, namely the Tank Museum in Bovington, which displays some 300 tanks and armoured vehicles, as well as the Keep Military Museum in Dorchester, Dorset’s county town. Culturally, there is less on in Dorset than in other regions of England, since it is so rural. However, the Bournemouth Symphony Orchestra founded in 1893, is a celebrated symphony orchestra that puts on 130 concerts each year. 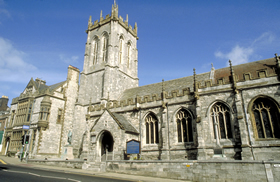 Likewise, Christchurch Priory is the longest church in England at 311 feet. Dorset was also the native county of writer Thomas Hardy, who set many of his stories in the fictional county of “Wessex”, set in Dorset. Likewise, Hardy’s hometown of Dorchester appears as Casterbridge in his books, especially The Mayor of Casterbridge. Douglas Adams also wrote The Hitchhiker’s Guide to the Galaxy while living in Stalbridge. 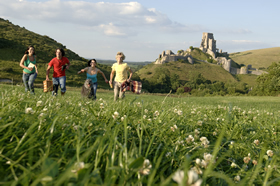 Friends running across a field with their dog reliving the adventures of 'The Famous Five' at Corfe Castle on the Isle of Purbeck, Corfe Castle, Dorset, England. 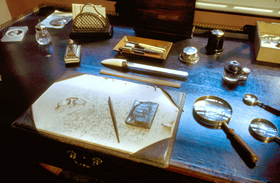 Reconstruction of Hardys study in Dorset County Museum, Dorchester, Dorset, England. 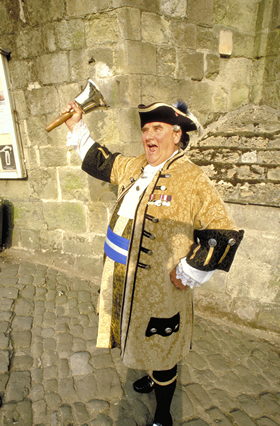 Town Crier On Gold Hill, Shaftesbury, Dorset, England. 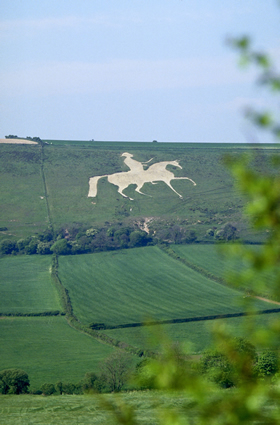 White horse hill carving, Osmington, Dorset, England. 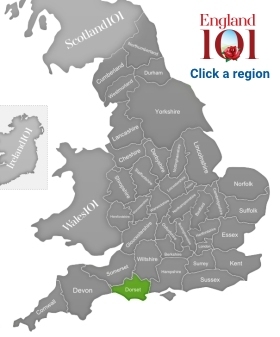 How much do you know about Dorset ?